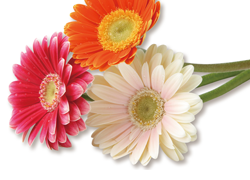 We employ our fresh produce distribution network to deliver high-quality flowers as well. Operating from our base in the Ota Market, the largest flower market in Japan, we collaborate in the flower business with domestic and overseas production areas, deploying optimal systems to ensure procurement of fresh flowers during periods of seasonal demand. 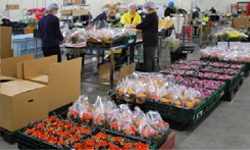 We process the flowers in temperature-controlled processing centers, arranging, packing and potting them, in response to demand from volume retailers. 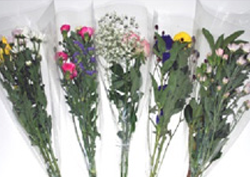 We supply packages of natural or processed cut flowers to volume retailers who engage in large-scale gardening supply and cut flower retail operations. We also provide total support for mass merchandisers' flower departments with processing, delivery and sales area development for casual flower sales. 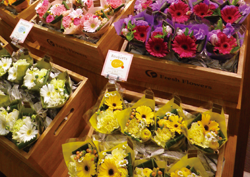 We conduct seasonal flower retail sales at our own store in Machida. We invite you to come see our exciting selection. Located on the 1st floor of the Machida Tokyu Twins East across from JR Machida Station, we offer a variety of fresh-cut flowers and potted plants from a desire to add pleasure to people’s lives.